A limited edition silver version of the Pentax K-1 complete with battery grip and the latest firmware update. Ricoh have announced a special limited edition K-1, with only 2000 units available worldwide. A high-grade silver-colour coating is used on the camera body and battery grip to perfectly match the silver FA Limited Lens, along with a special silver type SR badge on the front of the camera. 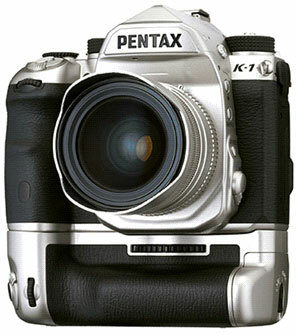 The metal hot shoe cover features a beautiful, mirror finish PENTAX K-1 Limited Silver logo. Two exclusive batteries are included and can be used simultaneously in the camera body and battery grip. The camera body comes pre-installed with the latest firmware (Ver. 1.41). The K-1 Silver Edition has an RRP of £2149.99 and will be available from Mid-September.